While my work bench lumber is being held hostage by snow ..
.. I might as well work on the mitre box saw. I left my lumber on the storage rack at school so no more working on the work bench base until I go back to class.So I started working on the saw for my mitre box. I used Matt’s recipe at the Saw Blogfor cleaning the saw plate. So I pulled off the handle and got out the Simple Green and wet/dry 400 grit sand paper. Rubbing in from tip to stern, I worked off the grim and rust. 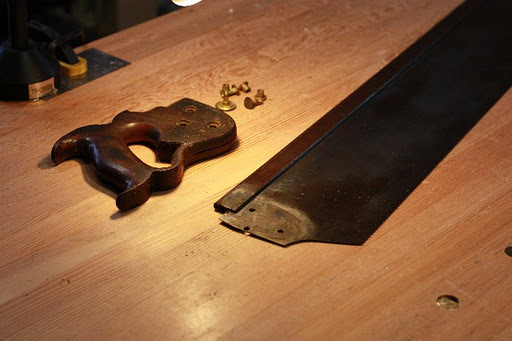 After a good rinsing and drying (hopefully no one will notice that the blow drier made a trip to the shop), I set the saw plate to bask in the radiant heat. Once thoroughly dried , I applied some paste wax for protection. If you look closely you can see the saw bench and sheet rock reflected in the plate. And look what I uncovered after removing all the grim. Now to sharpening. 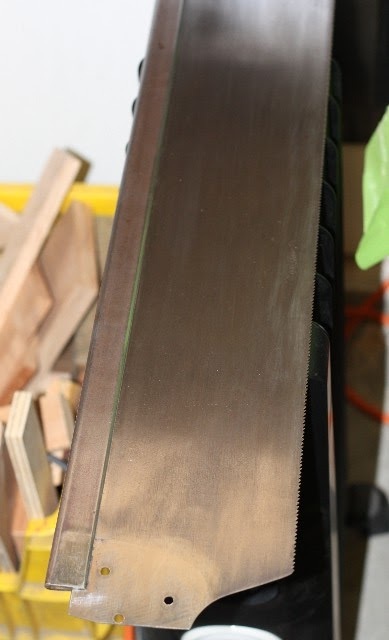 This entry was posted in clean, mitre saw, saw plate. Bookmark the permalink. 3 Responses to While my work bench lumber is being held hostage by snow ..